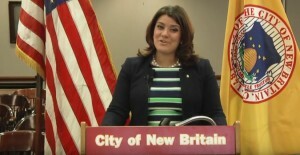 NEW BRITAIN—Mayor Erin E. Stewart on Wednesday released her 2016 State of the City address via YouTube as a way to highlight the city’s smart city initiatives that are transforming City Hall and moving it further into the 21st century. Members of the Common Council will be presented with a digital copy of the address on individual iPads this evening. Council members will also be provided with digital agendas rather than paper copies for all future meetings to save money. At the start of Wednesday’s meeting, Mayor Stewart will provide a condensed version of the speech to those in attendance. In February 2016, Mayor Stewart created the Mayor’s Energy and Innovation Committee to oversee smart city initiatives that will save the city money in energy costs and reduce its carbon footprint. Projects already underway include adding solar panels to school roofs, erecting the city’s first Fuel Cell, electric car charging stations, and transforming city street lights to LEDs, among other initiatives. Nutmeg TV will also air the address in its entirety as part of the show “Around New Britain with Mayor Stewart” throughout the month of March. In her state of the city address, Mayor Stewart highlighted the many successes the city has experienced over the last year.